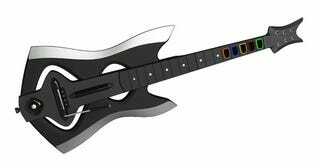 Every bundle of Guitar Hero: Warriors of Rock that ships this fall will come with Activision's new removable wing guitar controller, but only by preordering at GameStop will you score the axe of power. While Rock Band 3 is giving you a semi-real guitar controller, Guitar Hero gives you wings, a tactic that's worked well with energy drinks and feminine hygiene products over the years. And with removable wings comes special, limited edition wings, like the lovely set you score from preordering the $99.99 guitar bundle at GameStop. I wouldn't rush out to put your money down right away though. I doubt this will be the last limited edition preorder wings we'll be seeing before the smoke clears.